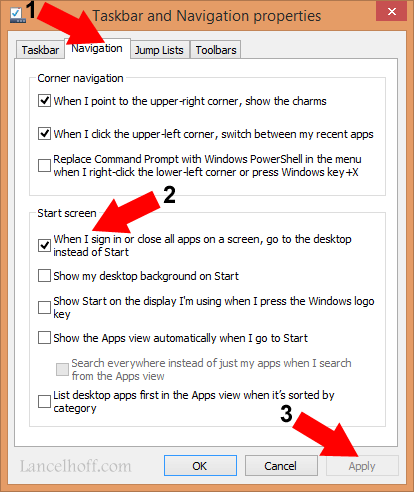 How to Boot directly to the Desktop with Windows 8: One of the most unwelcoming features of Microsoft Windows 8 for me, (aside from missing a Start Menu Button on the Desktop) has been the direct boot to a Metro Start Screen. I’d much rather boot directly into a familiar Desktop instead. Luckily, starting with Windows 8.1, users now have a choice to boot directly to the Desktop, skipping the Metro Start Screen. Oh, and a partial Start Menu Button is back. That’s all there is to it. The next time Windows 8 boots, it should skip Metro and go directly to your Desktop after you sign in.